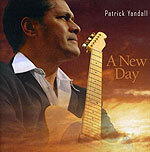 CD review: "A New Day"
Yandall's 10th album is a polished collection of his jazz-R&B fusion, a sort of modern take on the 1960s and '70s jazz-funk of David Fathead Newman or Les McCann. The slowly percolating syncopation provides a sparkling backdrop for the easy-listening supper club vibe of the songs. Yandall is a skilled guitarist, although fitting the atmosphere of the album, he rarely takes things too far technically, preferring to focus on tasteful leads and smart solos. Keyboardist Mark Pierucci and saxophonist Jeff Laakso share the lead and solo duties with Yandall, and give the music a nice, full sound with enough instrumental variety to keep things fresh. The 11 songs are all bright and uptempo with nice melodic hooks. The last track, "Mr. Fattburger," is a tribute to the late Carl Evans Jr., the keyboardist for San Diego-based smooth jazz pioneers Fattburger, who helped create the updated version of easy listening that is smooth jazz.